Does anyone know the part numbers of the two roof rails (gloss black) for an F-Pace MY 2018? I would also like to know the part number of the crossbars (Jaguar accessory listed on their website) that latch on the roof rails. 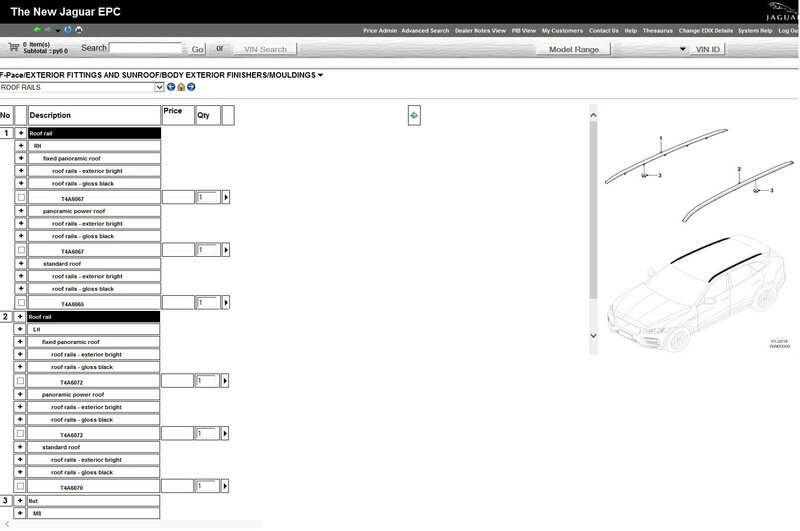 The part number for the crossbars is T4A13875 and is indeed listed in the accessories page. I'll bet the cost is "interesting". The simpler a part appears, the bigger the bill from Jaguar. The price seems to be around £428 per each roof rail ( Jaguar Partno_T4A6067_RAIL-ROOF_David Manners Group ). At the dealer, it is even more expensive. I'd say that is definitely an interesting price (it's just a piece of aluminium). When I purchased my F-Pace the salesman informed me the roof rails had to be installed during assembly on the production line. Mine does have them, but is this just salesman's bs? I leave you to draw your own conclusions about the salesman's level of product knowledge.